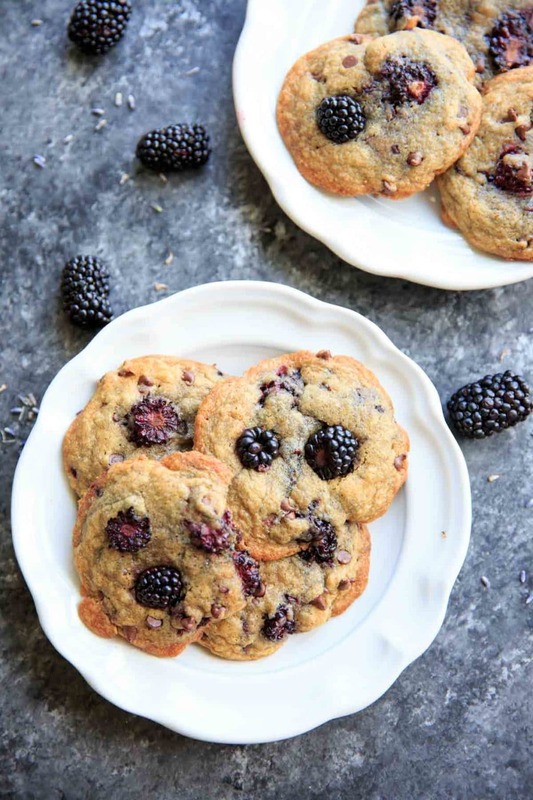 Blackberry Lavender Chocolate Chip Cookies – a unique twist on the classic with some fruit and dried lavender. Perfect dessert in summertime! Recently I was in serious need of some comfort food. My mind naturally went to chocolate chip cookies, but I had also been having a (weird?) desire to make something with lavender and blackberries that I just couldn’t let go of. Lots of my recipes start with me simply trying to combine my current cravings. Sometimes they work, and sometimes they turn into kitchen fails. The only reason why I thought this might work was because I was drooling over some of my favorite bloggers recipes like this blackberry cookie crumble and these blackberry lavender scones. Now don’t get me wrong, there’s a REASON why fresh fruit is not often used in cookies. It can make it SOGGY. That’s a big reason why my lemon blueberry cookies taste more like muffin tops. So there are a couple tricks I’d recommend. First, mixing in all the blackberries directly to the dough will add too much of the berries moisture and the cookies will likely end up very soft. You can save this a little bit by refrigerating the dough and adding a couple extra minutes to the baking time, but it is still a different consistency. I like chewy cookies but there is a fine line between chewy and soggy, and you might not know you’ve crossed it until it’s too late! What I like to do is either add a whole blackberry in the middle of the cookie before baking (kind of like a thumbprint cookie) OR add the blackberry slices immediately after baking, when the cookie is still soft. For the pictures I added some blackberry pieces to each ball of cookie dough (not mixed in the whole batch, if that makes sense) and also topped them with more right after baking. Now let me get to the lavender part of this recipe. I bought a whole bunch of dried lavender a long time ago before realizing that a little goes a LONG way. The other time I’ve used lavender in a recipe was by making a simple syrup and then draining the lavender buds out. Turns out you can also grind up the buds and use them directly in the recipe! But to avoid having your food tasting like potpourri, you just need to use a small amount. I ground up a teaspoon of it with the sugar. This adds just a hint of lavender flavor in every bite! 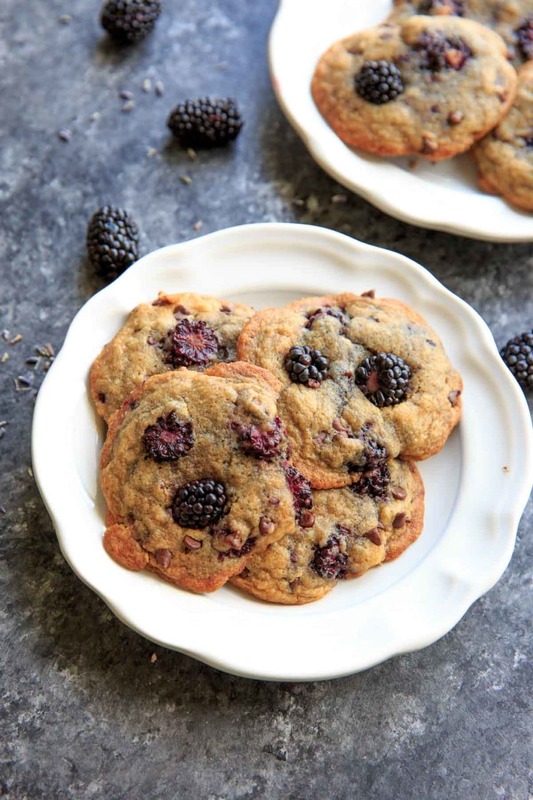 Blackberry Lavender Chocolate Chip Cookies - a unique twist on the classic with some fruit and dried lavender. Perfect dessert in summertime! 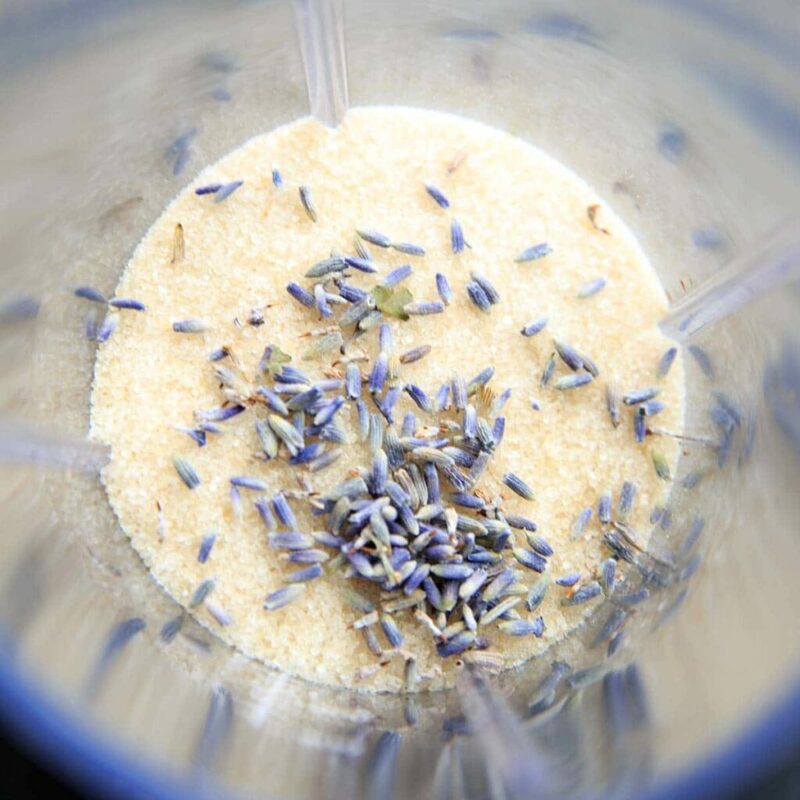 In a small blender or food processor, add sugar and dried lavender. Pulse a few times until lavender is blended into the sugar. In a large mixing bowl, combine sugar mixture, brown sugar, eggs, butter and vanilla extract. Slowly add flour mixture to the large bowl until all ingredients are mixed together. Using a cookie scoop or spoon, arrange dough on baking sheet (each cookie about 1.5 tablespoons of dough). Bake for 10-13 minutes or until edges are lightly browned. 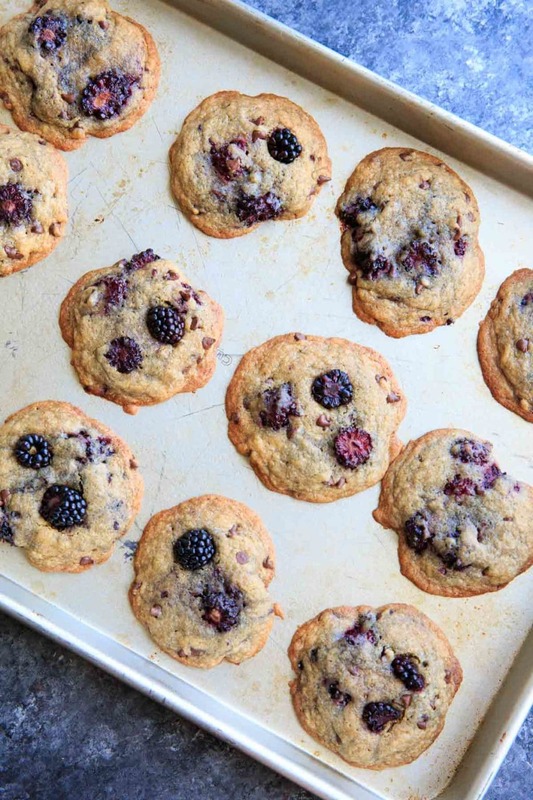 While still warm, lightly press in the blackberry pieces to the top of the cookies. Let cool. *I've substituted half of the flour with white whole wheat flour with success. **Melted butter makes it easier to mix by hand, and will result in a flatter, slightly crunchier cookie. If you desire a slightly fluffier and chewy cookie, use room temperature butter and/or refrigerate dough before baking. 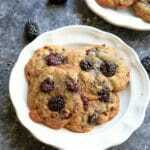 ***Mixing in the blackberry slices can make the dough too wet and cause the cookies to be soggy. What I like to do is either add a whole blackberry in the middle of the cookie before baking (kind of like a thumbprint cookie) OR add the blackberry slices immediately after baking, when the cookie is still soft. 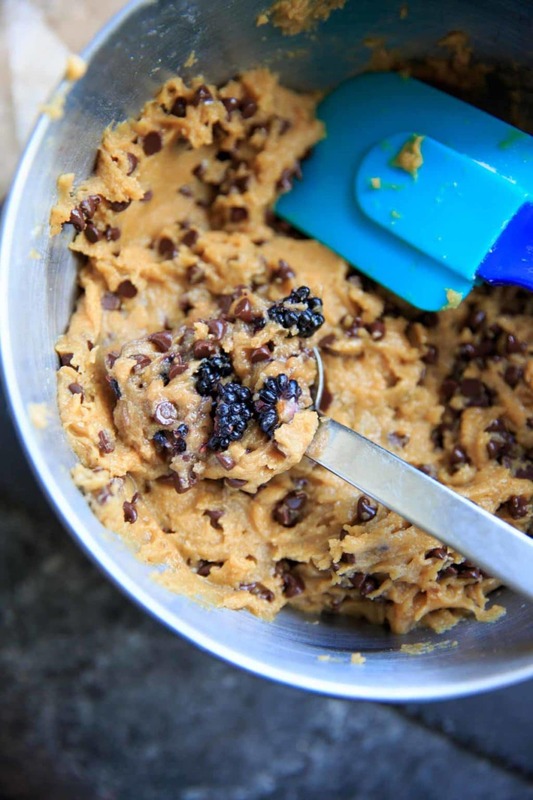 I’ve never once considered putting blackberries OR lavender into chocolate chip cookies—absolutely brilliant! I’ll be sure to save this recipe to try it next spring when my blackberries are popping off like mad. That’s one creative recipe, never thought of adding fruits on my cookies.. Possibilities are endless. I’m a big fan of lavender in desserts so this is very intriguing! I love the flavor of lavender! The unique flavor sound tasty with blackberries. Pour me a cup of tea and I would be set for the afternoon! This sounds delicious! I have edible lavender extract. Can this be substituted and if so, at what quantity? Thanks! I’m not familiar with cooking with lavender extract so I’m not sure how strong it is. I would imagine 1-2 drops would have the same effect but if you’ve baked with it before, use your experience as a guide! I will definitely make this cookie. I made for a Chuch Brunch,(along with my shaved butter) till time to mix into batter. When I make these cookies I’ll do the same.